The All New Generation PV400W Mini Digital Video Recorder from BEST is smaller and lighter than anything else on the market that has Secure WiFi! 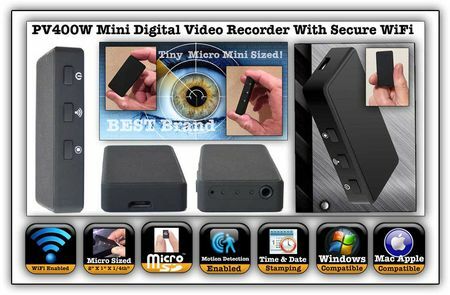 The BEST brand Mini Digital Video Recorder supports up to a 64GB Micro SD card and has a 2.5 mm camera AV port which allows you to connect small cameras into it. The PV400 Mini allows you to wirelessly stream any video recording to your smart-phone, tablet or other device. You can also WiFi control, view and download videos. It's also IP enabled which means you can stream video through the Internet and watch from anywhere in the world. This high technology mini digital DVR from BEST has a very simple three button operation so you'll be using this high tech cutting-edge DVR right out of the box in just a few minutes as your learning curve is very tiny while the technology inside is highly advanced! This is New Innovative WiFi Security Advanced Technology so you can now quickly and easily download and review your covert video on your smartphone or tablet through the new Innovative WiFi Security Advanced Technology from Beyond Established Science And Technology which is the BEST technology. BEST WiFi Security is WiFi stability, WiFi faster,WiF safer,WiFi transmission more private and WiFi more professional is what the New WiFi Security Brand Advanced Technology for use with covert video systems is now built right into this product! You can read more about it at the end of this page. With the introduction of the first WiFi Security enabled system from BEST, you no longer have to worry about wires and can securely stream your covert video to either a Windows or Apple OS system. Why Best Brand Technology: BEST Brand stands for Beyond Established Science And Technology. You will find that this brand hands you a cutting-edge covert video innovative solution advantage with it's HD resolution, perfected WiFi High Security and IP remote control enabled features. BEST brand takes existing technology and makes it better through it's innovative perfection and development in state-of-the-art engineering. To maintain the cutting edge of the covert video revolution, you want to stick with the BEST so we urge you to try the Beyond Established Science And Technology brand. You'll be happy you switched! New HD Button Camera Kit: The new HD Button Camera kit features a CMOS Covert Pinhole Button Camera with 720p Resolution. This camera kit has 0.03 Lux @ F2.0 (50IRE) Low Light Sensitivity. Buttons or screw heads screw Into Top Of Camera, The camera Comes With Two Screw Heads For Stationary Covert Video and buttons. It's like getting two cameras in one as you can use this camera with the BEST PV400W Pocket digital video recorder either as a walk around button camera or stationary covert video camera with the screw heads! Multi-Function Covert Video Operations have Never Been Better! With the new micro-sized BEST PV400W and button camera kit, you actually have two covert video applications in one small unit. This combo kit is state-of-the-art for walk around covert video. With the new micro-sized DVR which can be motion detection activated, it's also great for stationary covert video applications! Either way, you can use the Secure WiFi and IP enabled feature and view what's going on in real time from anywhere in the world on your smartphone, computer or tablet. IP enabled lets you control, view, and download video from anywhere in the world!